This dissertation describes and explains the distribution of Russian complement clauses with the complementizer čto. It is shown that complement clauses with čto display distributional restrictions that are not manifested by their English and Dutch counterparts and that do not follow from the standard account of complement clauses in the literature. Two classes of environments are discussed where such restrictions are observed, namely, complements of speech act verbs in their non-agentive uses and complements of nouns. In order to account for the observed restrictions, this dissertation argues that clausal complements in Russian project a DP-layer and thus are subject to the Case requirement, just like nominal complements. Consequently, clausal complements must appear in Case positions, in contrast to the standardly held view. It is proposed that in apparent “Caseless” positions clausal complements are licensed by a null preposition, which has licensing conditions related to its semantic interpretation (as a two-place relation between a proposition and its “utterer”/“holder”). 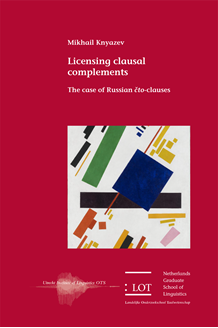 As a result, the observed restrictions on clausal complements in Russian follow from the Case requirement of clausal complements coupled with the licensing conditions on the null preposition. This dissertation is of relevance to researchers working on the syntax and semantic of clausal complements, Case and the grammar of Slavic languages.